ATN TIFSFI1430 FIITS14 3rd Gen. IIT Fusion Imaging Thermal System FREE SHIPPING! The ATN FIITS14 3rd Gen. IIT Fusion Imaging Thermal System combines a third-generation night vision scope and a thermal imaging camera into a single platform. Images from both devices are combined to form one composite image, providing the advantages of both systems for more useful, more detailed viewing in low or zero-light conditions. The thermal camera includes a sensitive microbolometer that is capable of detecting a human at nearly half a kilometer, while the night vision device features an infrared flood illuminator, providing a clear and detailed picture even without any ambient light. This makes it easy to track suspects while maintaining full awareness of surroundings, guaranteeing an undeniable tactical edge. 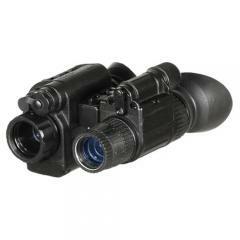 The lightweight device is suitable for handheld use and can also be mounted on headgear or a helmet for hands-free binocular use. ©2002-2019 CopsPlus.com: ATN TIFSFI1430 FIITS14 3rd Gen. IIT Fusion Imaging Thermal System FREE SHIPPING!